From coffee to condiments, and everything in between, this Tablecraft 402 2 T. measuring scoop will quickly become your go-to tool for fast, accurate portion control. Its durable 18/0 stainless steel construction is enhanced by a beautiful mirror finish, great for front- or back-of-the-house service. For additional convenience, this spoon is dishwasher safe for easy clean up at the end of the day. This measuring scoop is a great size and good quality. It works great for measuring coffee grounds, spices, or liquids for dressings, etc. It's a great buy! I needed a 2 tablespoon measuring scoop and I’m glad I ordered this one. It’s got a nice finish and descent weight to it. Definitely not some light piece of junk. There is something very satisfying about a mundane object that gets used every day when it's beautifully designed. This heavy scoop feels good in the hand, doesn't lose its shine after a thousand washes, and is perfect for coffee. I am in love with these scoops. I bought several but now I think I may need to reorder so I have them for everything! This 2 TBSP scoop is durable and easy to clean and store. It is the perfect size to measure a variety of ingredientes in our donut shop. We recommend this scoop to anyone in the restaurant or food business. Super high Quality scoop especially for the price. Doesn’t bend or break. Perfect for measuring supplements and coffee etc. very ergonomic simple deign as well. The 2 Tbsp. Stainless Steel Measuring Scoop is a good, heavy duty product. I am using this for scooping, measuring, and shaping, definitely a versatile tool. Very strong, good feel in the hand, great public presentation in the shop. I bought two for the coffee shop and I am pleased with the product. Perfect scoop for various things. I use my scoop for coffee/hot chocolate mix and also measuring batter into small cupcake pans. The scoop is very sturdy and thick and I imagine will hold up well for years. We like this measuring scoop for both coffee and other dry goods. The scoop is dishwasher safe and made of durable stainless steel. We like the look of the scoop. This scoop has a 2T measuring size. We use this to measure out coffee for pour overs. It has a good shape and the handle fits well in your hand. The scoop feels like it's made from a substantial material and isn't flimsy. The Tablecraft 2 T. Coffee/ Measuring Scoop is strong, sturdy and a highly reliable tool for measuring. It works great for use as not only for coffee but can be used for any liquid or dry ingredient. Fantastic product. We use them by the dozen on our food line as measuring scoops for food cost controls and they work great, highly recommend. This is thick and made with quality stainless steel - I don't see it bending any time soon, even if it was abused. I'm using it to portion out salt for my bread dough, so it is under a somewhat corrosive environment and it's held up great so far (2 months). No sign of corrosion from the salt whatsoever. 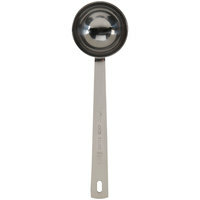 This 2 Tablespoon stainless steel measuring spoon is perfect. The stainless steel looks beautiful, feels very sturdy, and the handle is the perfect length for reaching down in to a bag of coffee or herbs. This makes scooping out measurements quick an easy. Portion control it something we all should be paying attention to. It is great to know your getting the same measuring daily so you can get the same quality taste from perfect measuring. I use this measuring spoon for coffee, but I also use it for making mug cakes since it often asks for 2 tablespoon flour portions. This Tablecraft 402 2 T. Coffee / Measuring Scoop is very durable easy to use. I use it to measure sugar and whatever call for 2 TBS. Great little measuring spoon for coffee. Makes measuring coffee twice as efficient as opposed to using a table spoon. Just one scoop in the filter and coffee is ready to brew! A great time saver!!! This is a very sturdy and nice-looking measuring scoop. I've been using mine only for coffee, but it can be used for plenty of other things. Worth buying. We purchased the 1 T. and 2 T. scoops. We have been so pleased with them that we actually wish wed had purchased more. Very durable and well constructed not to mention easy to clean. We have washed them several times and even taken a dry cloth and wiped them out with pure ease. Highly recommended! The Tablecraft 402 2 T. Coffee / Measuring Scoop does not just have to be used for just coffee. You can also use to measure out 2 Tablespoon of molasses. There are so many uses. I use these as a scoop for pancake batter to make slightly smaller than diner size pancakes. The round shape helps make the pancakes turn out perfectly round. I use this for hot chocolate that I sell in store but it works perfectly since it's 2 tablespoons per serving. The scoop doesn't feel flimsy. I purchased this spoon as a portion device for our pesto pasta dish. it works perfect! 2 tablespoons is just what i wanted and it has a great heavy weight to it. so i can tap it against the saute pan hard with no problems at all. this spoon is built to last!! We ordered this 2T. spoon from the beginning with several of the other sizes 1T. and a 1T. / 2T. set. We use them to measure out drink products and have not had any issues at all! They are stainless steel, easy to clean and even easier to wash. Very pleased with this purchase of spoons! We use these like crazy for accurate portioning of our finely chopped vegetables & nuts. With multiple holding pans the shorter handles are perfect so that they don't get in the way. We use these to portion all of our dry salad toppings. This has been a life saver to preserving our food cost. Who doesn't want to save money on food?!?! Great quality scoop! These are very nicely made measuring scoops. They are easy to clean and despite having awesomely abusive employees the handle is not bent at all. Just what I needed for home use for scooping coffee. Sturdy build and looks great too. Makes measuring coffee fast and more accurate. No more wide variety of strengths in my home brewed joe. These are fantastic spoons. Long enough to reach to the bottom of deep coffee bags and have a perfect 2 tbsp capacity. The best spoon I've ever found. Highly recommend. Sturdy scoop will last me for the rest of my life. That is if no one steals it! High polish and visible measure marks make it easy to read quickly and it really makes life easier when you have nice tools like this one. These look very nice and are of heavy construction. I plan to order several more sometime to use in coffee gift baskets and loose leaf tea baskets. This is a nice heavy weight scoop! I use 2 scoops for a perfect pot of coffee. Has a nice long handle that works perfect for deep containers.